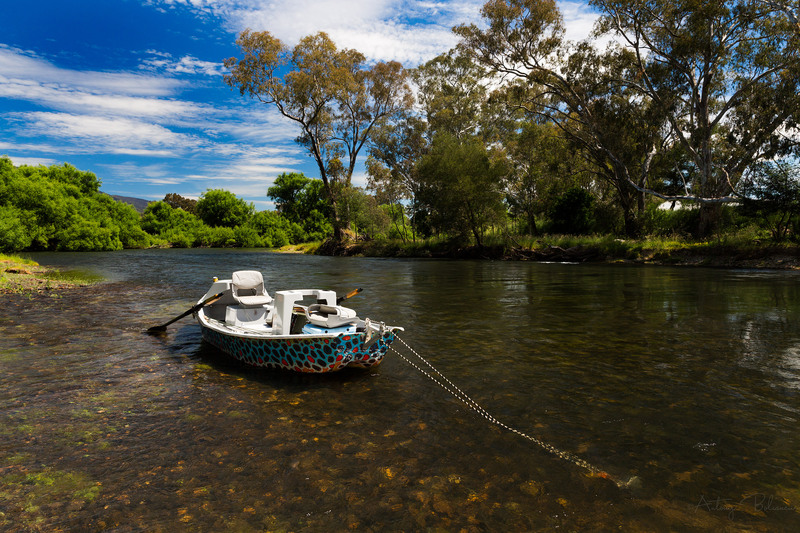 We are the only professional drift boat service on the Goulburn River, with 25 seasons of exemplary and incident-free operation now firmly tucked under our belts. 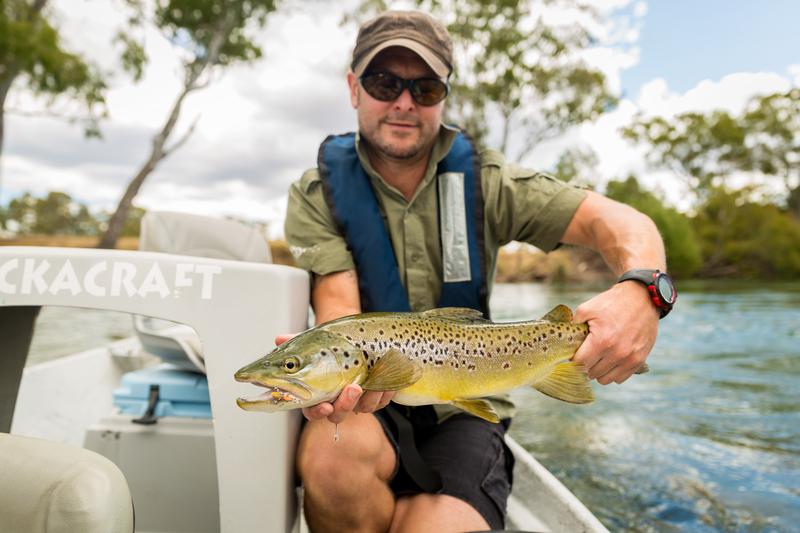 We offer evening (3 hour), half day (4.5-5 hour) and full day (8 hour) drift boat trips on the Goulburn River, and we have four boats available every day. We have the very best of the local guides on our roster, and we can show you an incredible day out, and all within day trip distance of Melbourne. 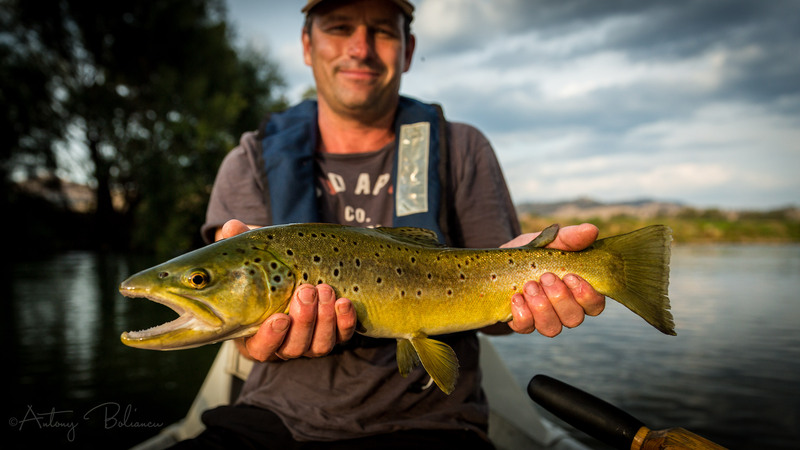 Fishing from a drifting boat is one of the most pleasurable ways to fly fish for trout and we have been running float trips on a daily basis since 1994. While we originally started off with inflatable rafts, we eventually switched to the more maneuverable and comfortable (and costly!!) Mackenzie style drift boats and skiffs. These were especially imported from the USA and we now have four boats available every day. 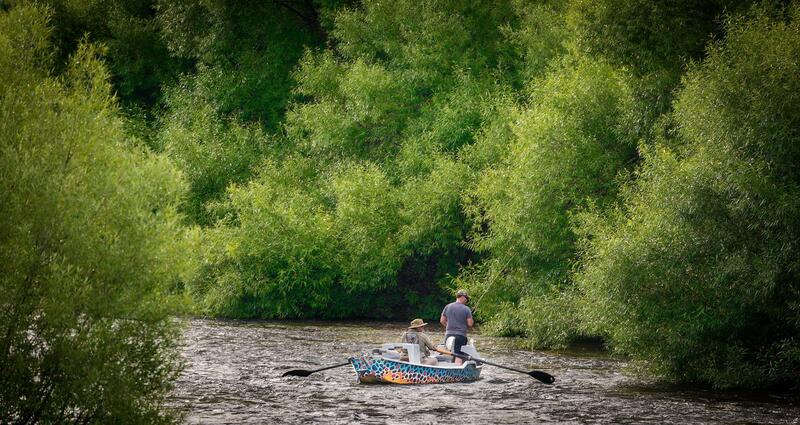 These boats are extremely comfortable and safe when being rowed by an expert guide, allowing the angler/s on board to explore the river and fish literally thousands of likely spots with ease. 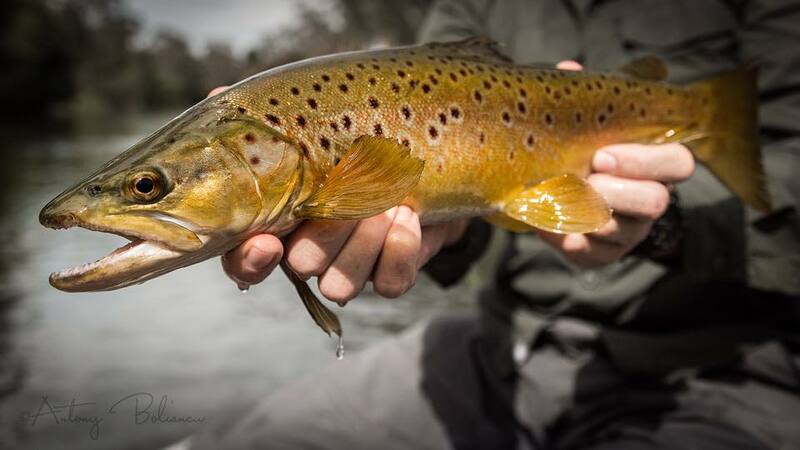 Backwaters and off-river lagoons offer superb sight fishing and mid-river gravel bars, inaccessible to the bank angler, are but only two of the commonly fished features while drifting. Drift boats are comfortable, stable and safe. Since beginning operations back in 1994, we’ve not had a single safety incident. 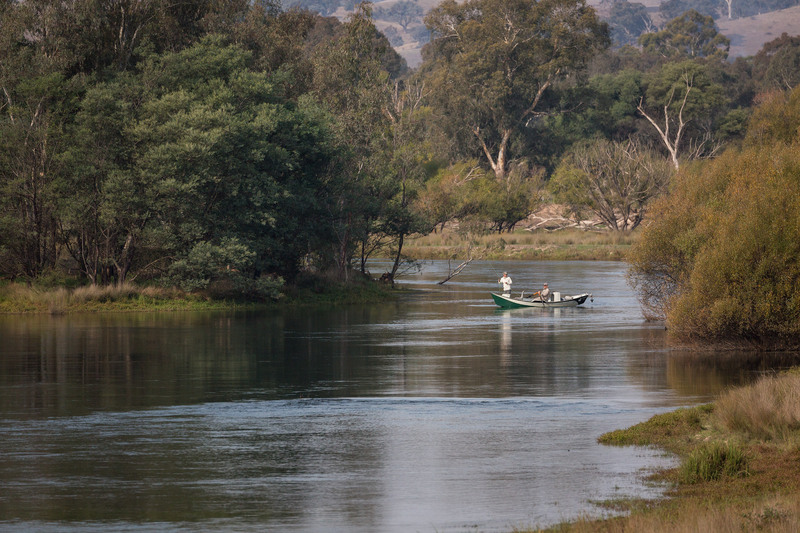 While floating the Goulburn, the fly caster has access to both banks, and because the cast is parallel to the current, it runs free of drag, often for 30 metres or more at a time. A boat may cover up to 25 kilometres of river in a day, unfolding a feast of countless fish-holding features such as bubble lines, runs in the centre of the river, high impassable banks, outer edges of willow trees, backwaters, steep-edged hopper banks, side-channels and gravel bars; nearly all of which are inaccessible to the wading angler at times of higher water releases from October to May. 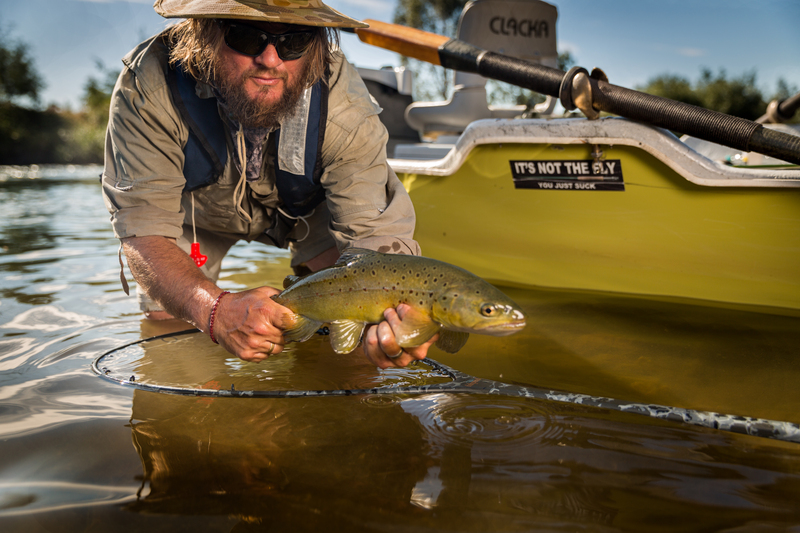 A drift boat with an experienced guide on the oars, opens up the entire river to fishing. Here Erhan enjoys the rewards of a day out on the river. 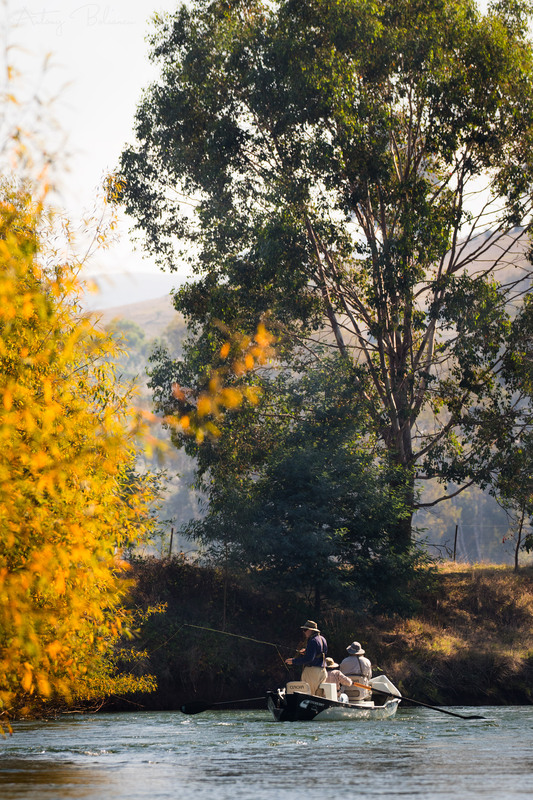 Polarising vast weed beds and stalking rising fish from a boat being stealthily and silently maneuvered by a guide, is something every fly fisher should experience, and a big part of what we do is finding fish before we fish to them. 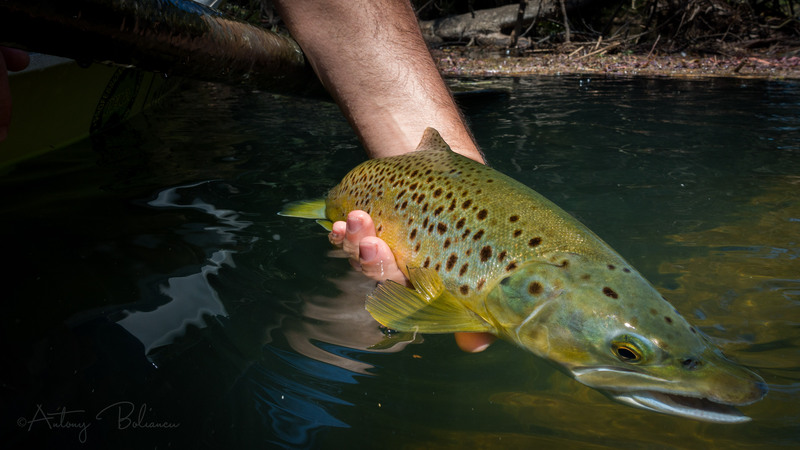 Sure, anyone can launch a boat and occasionally run into a fish as they drift downstream, but after 24 years of guiding on this ‘technical’ river on a daily basis, it’s safe to say that we know it better than anyone else, and we can ensure that you have the best of the available opportunities, on any given day. 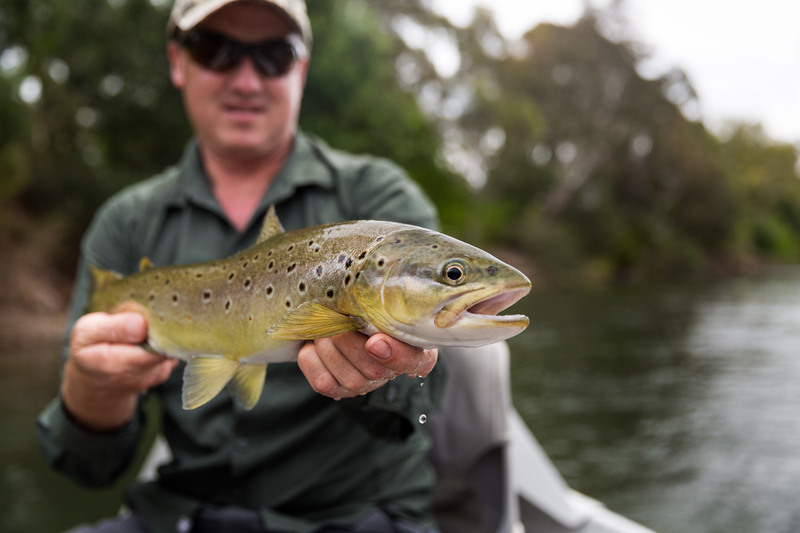 Over the past two decades we have developed a vast array of skills and techniques designed for fishing the Goulburn from a drift boat. 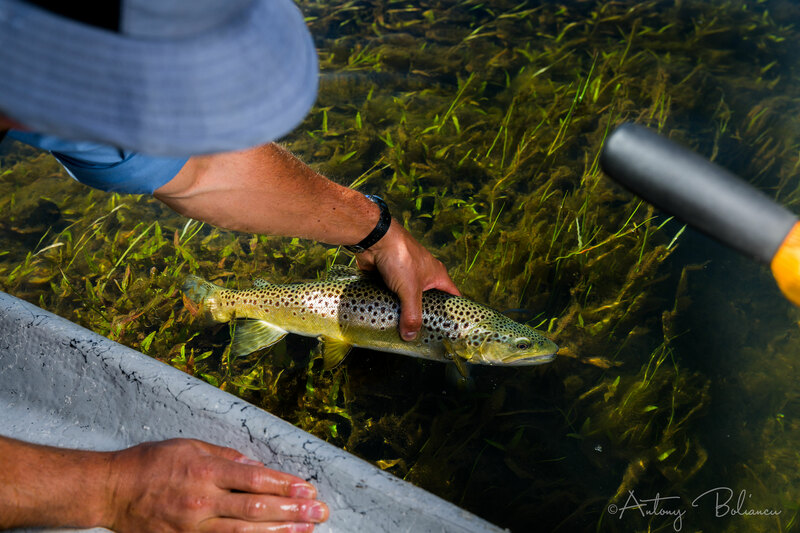 While much of it was learned here on our home waters through hard work and trial and error; more and more of what we do is now influenced by our time spent fishing with the best guides in places like Montana, Idaho, Wyoming, and Patagonia. These varied and new experiences ensure that we are always learning, and thinking about how we might improve what we do back here on our home waters. The drift boat fishing starts as soon as the river is high enough in spring and doesn’t stop until the end of Autumn when the irrigation season draws to a close. This shot was taken in Autumn. Frequently, four or five rods will be rigged to cover a variety of situations that may arise on the day. 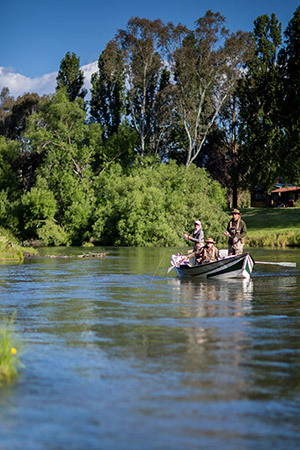 A float trip on the Goulburn could see you doing everything from stalking a backwater cruiser with a beetle, to nymphing a mid-river gravel bar; from slapping a baitfish pattern into an undercut edge, to carefully presenting to a fish sipping spent spinners during the evening rise. 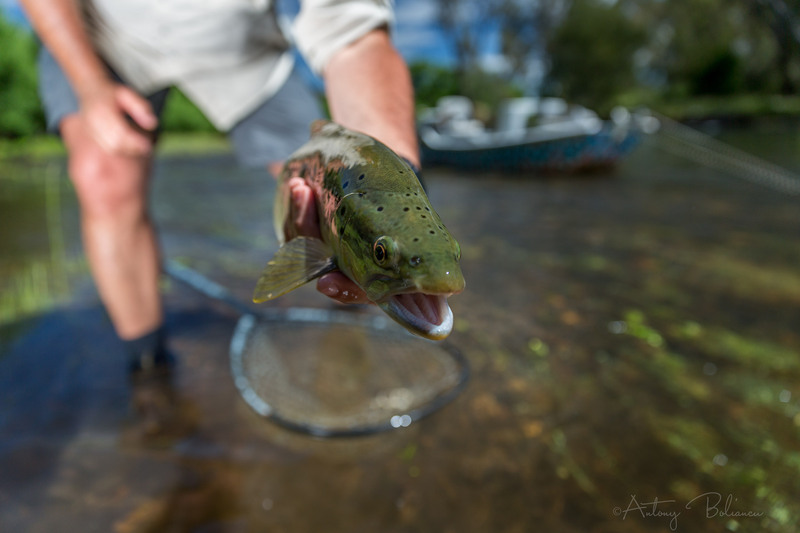 It really is an exciting river to fish and the challenge of consistently doing well for our clients, every single day at all different river levels, is what drives all of our guides to produce their best. 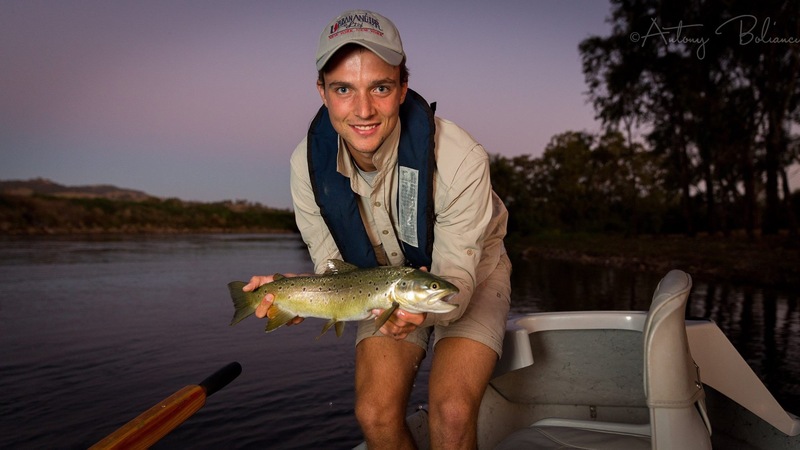 The Goulburn River has decent numbers of 2-3lb fish. Every so often we get one in the 5-6lb class. 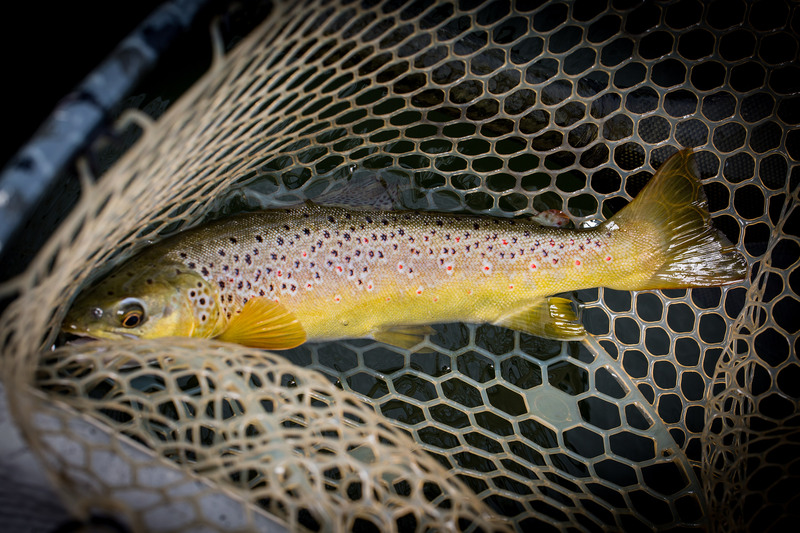 Most of the fishing is dry fly. 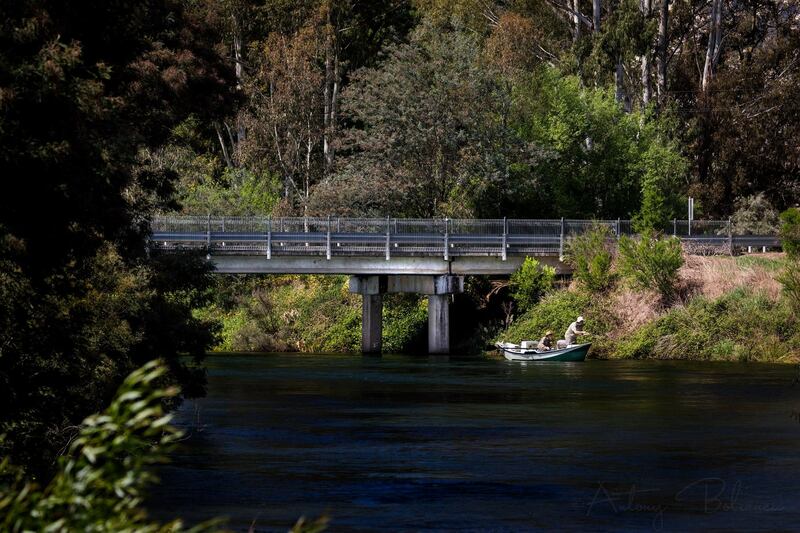 Float trips on the Goulburn River are available every day. We guide on all public holidays, except for Christmas Day, and are available at any time of the day, on any day of the week. Our float trips are extremely popular and while you can walk in off the street and be on the water within 30 minutes, our advice is to book ahead where possible. Half, full day and ‘Evening Rise’ drifts are available every day of the season and the start/end time is dictated by your personal needs/schedule. 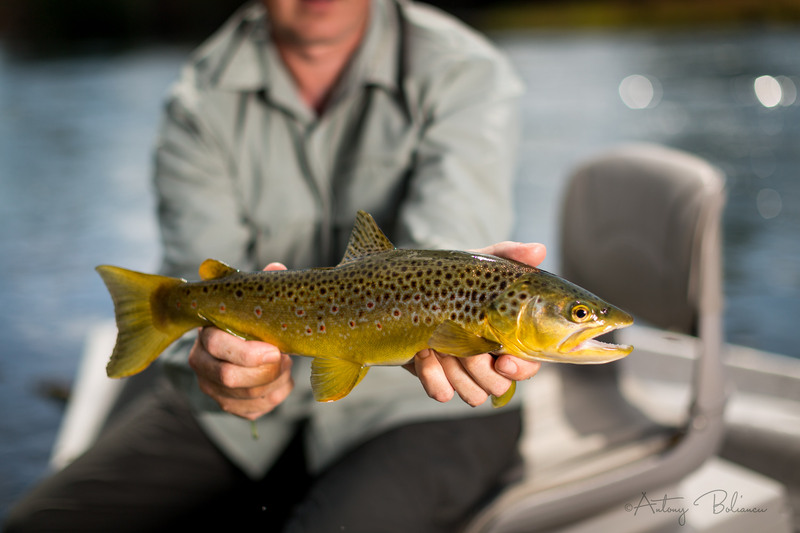 There’s room on our boats for two anglers plus the guide, meaning you can bring a friend with you. Non-fishing partners are more than welcome and it is a very pleasant way to spend an afternoon; ‘watching the world go by’ from the back of the boat. If you wish to drift with a bigger party, we simply use more boats. As with all our guided/teaching trips, we will supply any gear that you do not have. 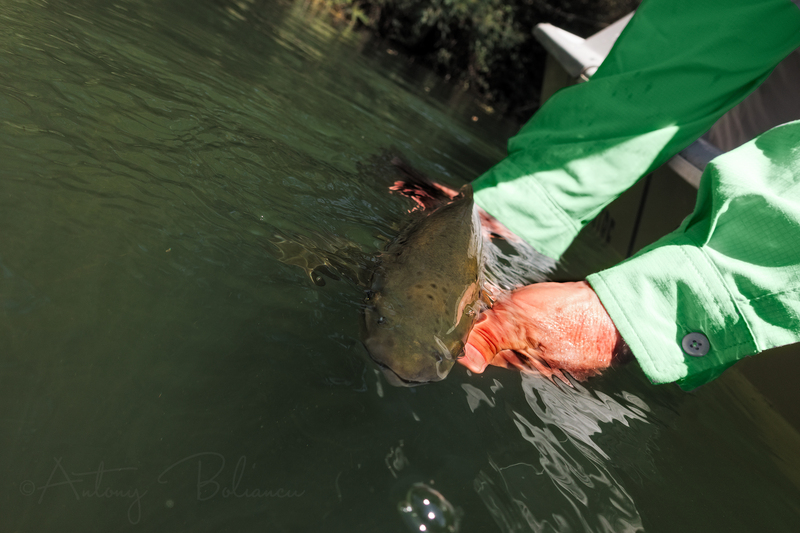 While the guide will work hard all day to put you in front of fish, strict attention to safety is our highest priority. Since commencing operations in 1994 we have not had a single incident. All GVFFC trips have a strict catch and release policy. This is to help ensure the river’s moderate stock of fish is maintained. We will however, ensure that you get some high quality photos of your fish. Done properly, the fish is released unharmed and the moment is preserved forever. 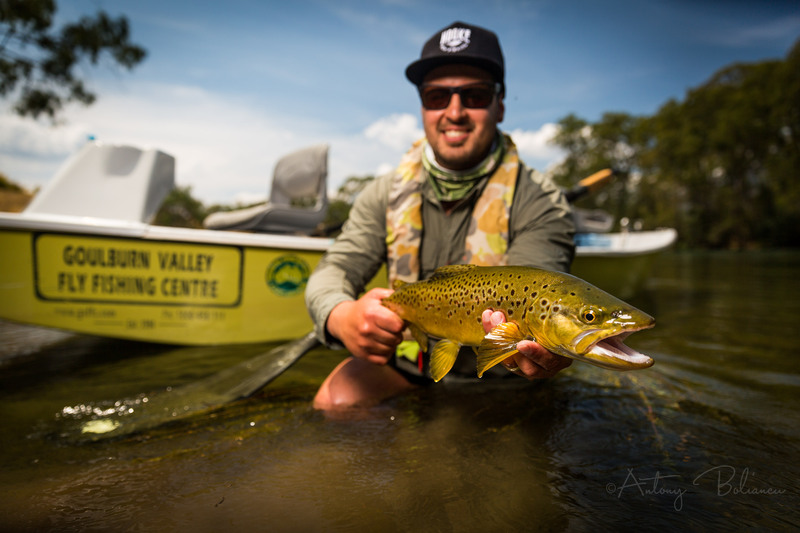 All float trips include a professionally accredited guide to both operate the drift boat and ensure that you have the best fishing experience possible on the day. Terminal tackle is included (tippets/flies), as is cold water, transport and use of any gear that you don’t have, on a replace if broken basis. A full day trip also includes lunch. 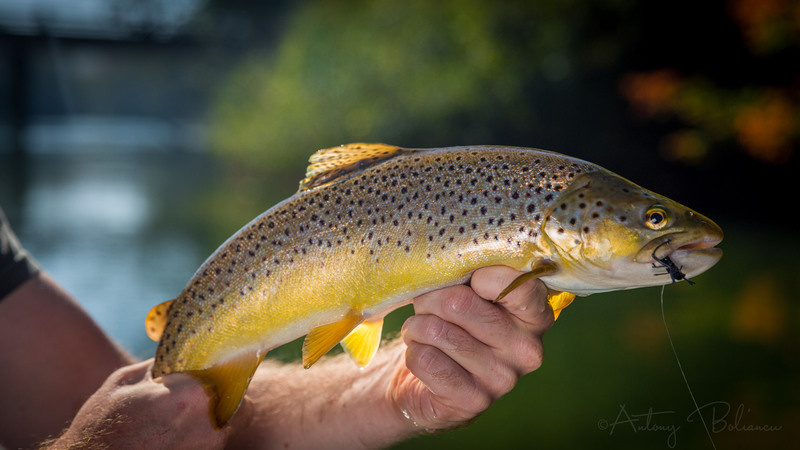 * Full Day – 8 hours —— $650 1 angler, $690 2 anglers – includes sandwich lunch. 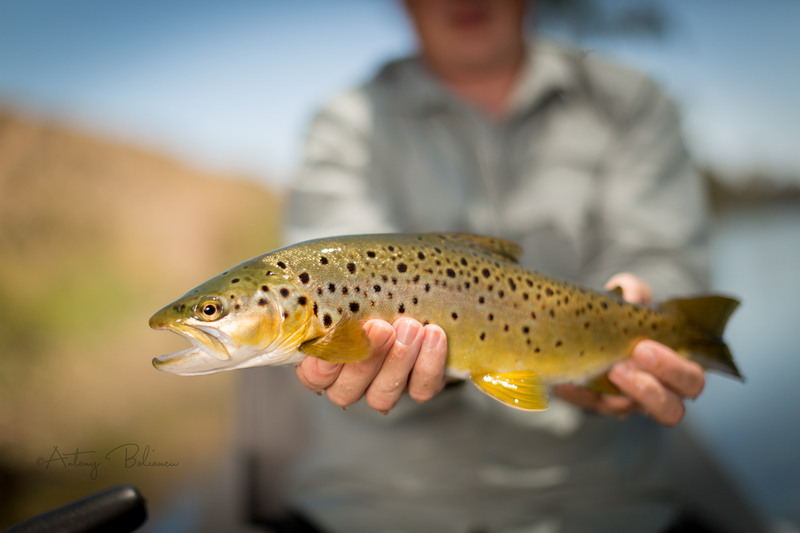 ** All guided trips include use of gear (if required) and all flies. They also include drinking water. Lunch is provided for all full day bookings. BYO lunch and save $10 off the advertised price. Please phone us on 03 5773 2513 or 0418 995 611 to learn more or make a booking. We are available from 8am – 10pm, every day of the year. 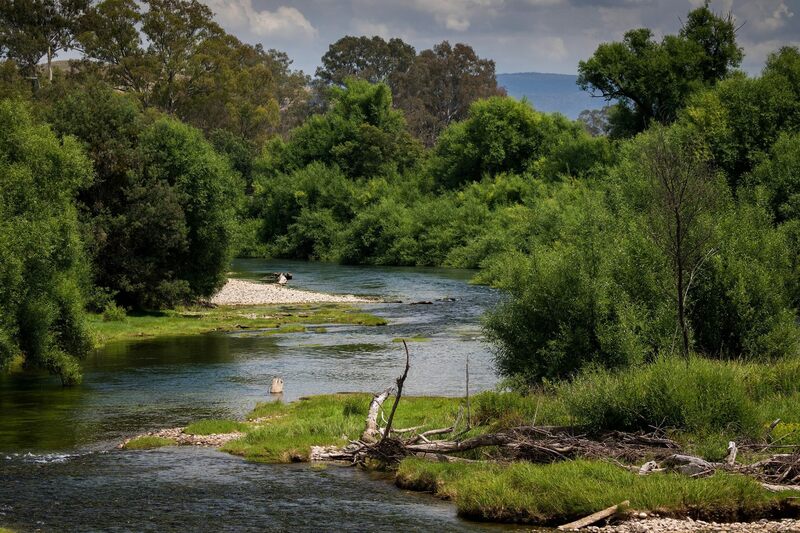 The Goulburn is one the prettiest rivers in Australia and has some of the best fly fishing as well. It fishes well at all levels. The view upstream from Gilmore’s Bridge.